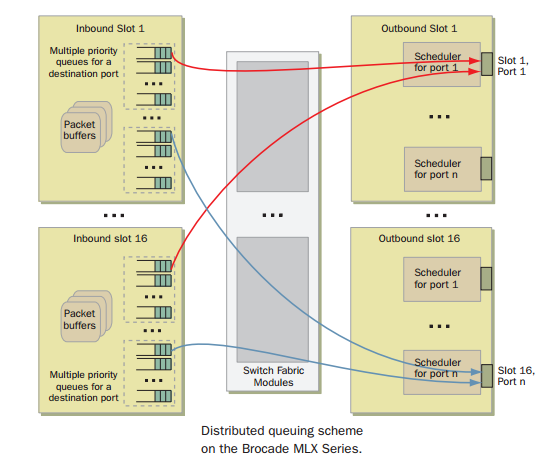 The Brocade MLXe is a switch router with all the buffer on the input side of the line cards. The diagram is taken from an architecture paper. The buffers are on the line cards. Hence listings for each of several line cards. Brocade provided me with a chart that details some of the policies that control the maximum size of a single queue -- designed to keep one queue from taking all the cookies. Internal to the interface cards, memory is organized in particles. Or if you prefer, call them cells. Particles are chained together as required to make buffers as large or larger than the packets they hold.